As a gardener one of the concepts that we try to create in our gardens is that of “rooms”. Just as we have different rooms in our houses with different functions, decorations and points of interest, so we need to try and lay out our garden. The concept of rooms would differ according to the size of your garden. If you have a very large garden these rooms will probably have some form of physical barriers between them. This could be a wall, a variance in levels, hedges or large trees or shrubs. The principle is to break the garden in areas where the casual stroller would be enticed to walk from one room to the next, being led by the expectation of what they would find behind the next hedge or tree. In a smaller garden it is probably impossible to create physical barriers, but still the garden, even a single border, could be planted in groupings, drawing the observer along and creating an aesthetical flow to the garden. We are fortunate that many of the different rooms we need for birds are much in line with the groupings we often would do as a matter of course. But then this makes sense, we would group some of these plants together as we feel nature has intended them to be grouped, which is exactly what nature does to maximise the benefit from the species that feed or pollinate that grouping. But I have to put in a word of caution. We should not take grouping to the extreme, in the end you don’t want to plant all your nectar producing plants in one spot with none of them elsewhere in the garden. The ultimate aim is to create a room where there is an abundance of certain types of food, i.e. fruit or nectar. Choose the plants in such a way that there is a succession of food over as long a period of time as possible. This becomes the centre attraction for the species that you are trying to attract. But within our urban gardens the borders of our sanctuary is our outer perimeter fence. We can control our attractions within this border, but not outside of this, so the birds finding our rooms, do so by luck. Or can we influence this? I believe we can. This will take a bit of sleuth work over a period of time, and one would need to conduct it in such a manner that the neighbours do not cry peeping tom! No, honesty, it does take a bit of peering over the neighbours walls. Ideally you want to create corridors to your garden, and specifically to your focus attractions or rooms. let’s explore an example of this. I have planted a nice aloe garden on the western boundary of my garden. On the other side of my wall is the street I live in, and across the road is a nursery school with lawns and jungle gyms. Not much attraction for nectar feeders. Unfortunately I had to locate the aloe garden there as it can withstand the amount of sun that the spot receives and the heat reflected from my house. In order to attract birds to the area, I noticed that one of my other neighbours have some Cape Honeysuckles in their garden. I then made sure that I planted some Wild Dagga in my grassland patch, which is visible from the neighbour’s honeysuckle. Further on I planted a Krantz Kraal Aloe, which fits nicely in to a mixed border as it makes a shrub. Again this is visible from the Wild Dagga, and from this aloe bush my aloe garden is visible. All these plants flower at roughly the same time, so in effect I have created a corridor that leads birds from outside my garden to the spots that I would like them to be in. 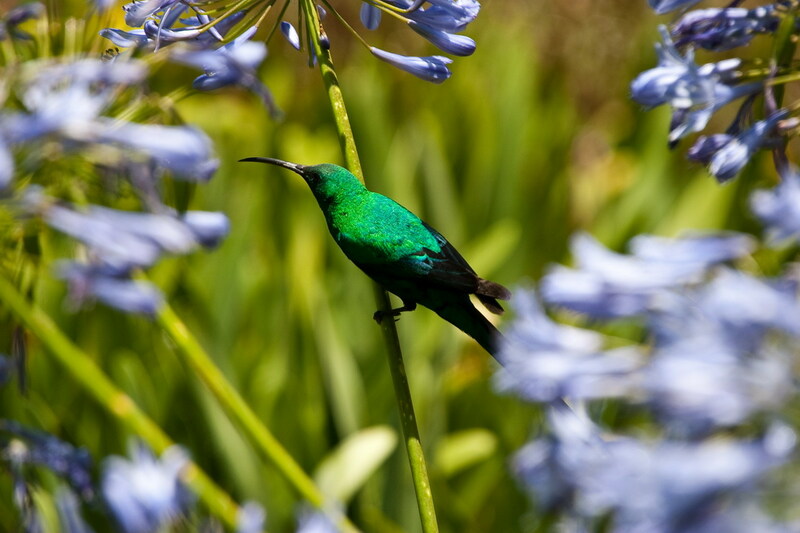 Fortunately once they have found the aloe garden, they keep returning to it for the season, and their calls then again attract more visitors. I believe that a good bird garden should have four main groupings, and a fifth group of plants that should be interspaced within these groupings. Please do not go out this weekend and divide your garden into four, and rip out everything that does not fit into the group. Ultimately these groupings become clusters in the larger garden. I have a half acre property and in total my groupings probably take up just more than a third of the garden. The rest of it is taken up by lawn and mixed borders, but I use these to help create the corridors. To me there are three “super” trees. If bird gardening was cricket these would have been the all rounders. They are the Sycamore Fig (Ficus Sycamorus), Tree Fuchsia (Halleria lucida) and Common Coral Tree (Erythrina lysistemon). 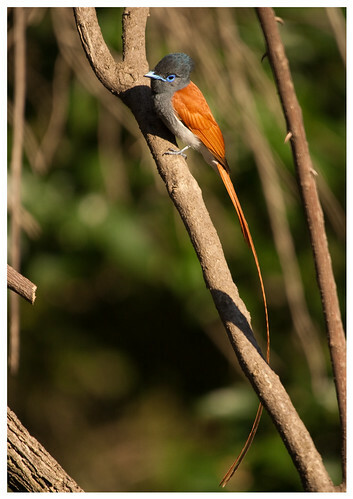 All three provide good nesting sites, the fig and fuchsia are both evergreen, providing shade and protection and the coral tree has small thorns. The coral tree and fig are both soft wooded and is ideal for hole nesters to excavate. Ficus not only bears an abundance of fruit but also attracts many insects, most of the species requiring specific wasp species to pollinate them. The Coral tree and Fuchsia flowers are also nectar rich and attract many nectar feeders and the fuchsia bears fruit that are eaten by frugivorous birds. Then there are those plants that you should not have in your garden..